Future Rock will hit the road this April, with a slew of support acts, and making stops in select cities in the Northeast, Southeast and Midwest. The tour starts in mid-April with Northeast dates in Burlington VT (4/15), Southbridge MA (4/16) with The Indobox, and capped off with a $5 blowout with Telepath in Brooklyn NY (4/17) at the amazing Brooklyn Bowl. FR then turns to the Southeast with The Malah for stops in Raleigh NC (4/21) for Mug Night, Asheville NC (4/22) and Savannah GA (4/23). The Southeast cluster is capped by a monster blowout at the brand-new 412 Market in Chattanooga TN (4/24) with The New Mastersounds and Salvador Santana on as support. 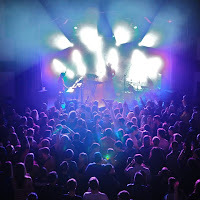 Future Rock then returns to the Midwest for stops in Madison WI (4/29) with Kinetix and Ames IA (5/1). This run is highlighted by a blowout in our hometown on Chicago IL (4/30) at the Park West with our good friends from Amsterdam, C-Mon & Kypski. FR has also scheduled at triumphant return to one of our favorite venues, the Canal Club in Richmond VA (5/7). Stay tuned for more Spring and Summer show announcements. And, as always, check the Shows Page for details and tickets. Chattanooga 4/24 cancelled, Knoxville to the RESCUE!